This clever St. Cecilia feast day idea, from guest contributor, Rebecca Collazo, also uses a play on words - suggesting a jam and biscuit bar for refreshments to a musical jam session. Rebecca is a homeschool mom to four wonderful kids who shares that she loves reading to her children, having poetry tea times, teaching writing at a Catholic co-op, and traveling to places of literary and Catholic significance. Thanks again, Rebecca, for sharing this idea for a fun gathering of musicians and food event to honor St. Cecilia. Hopefully this gives you enough time to think about having a jam session for St. Cecilia sometime next week. 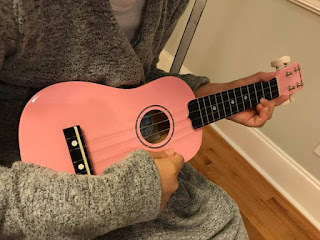 My daughter Celia, her name a variant of Cecilia, is a wonderfully talented singer, pianist, and budding self-taught ukulele player. It makes my own heart sing that she is so naturally gifted in an area that I myself have zero talent. Who knew when we chose the name that it would work out so perfectly? I like to think that St. Cecilia, patron saint of musicians, has a little something to do with that! We have heard it said, “To sing is to pray twice.” Why not gather loved ones to do just that? 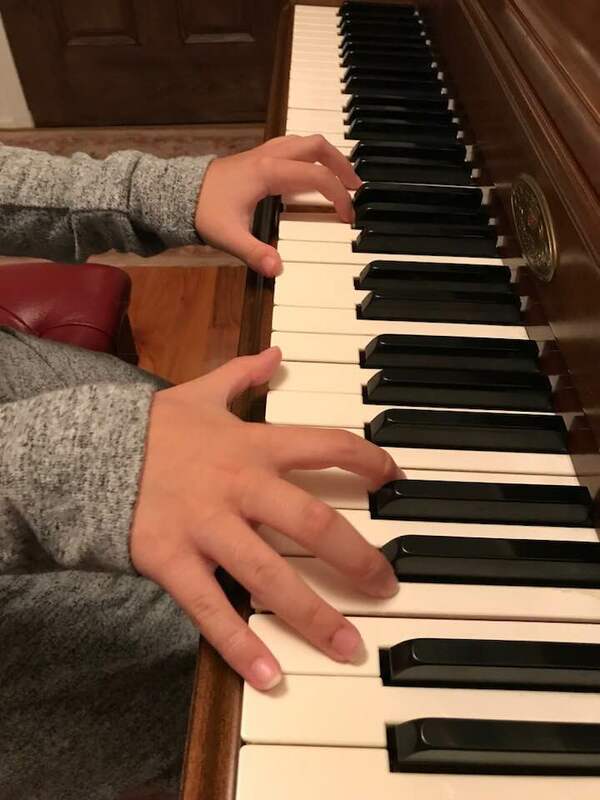 To celebrate this patroness of music, this year my family plans to host a St. Cecilia Jam Session. Since her feast day falls on Thanksgiving this year, I feel like she would approve of celebrating a day early, or even squeezing in a little breakfast fun on Thanksgiving morning with relatives already gathered for the big feast). 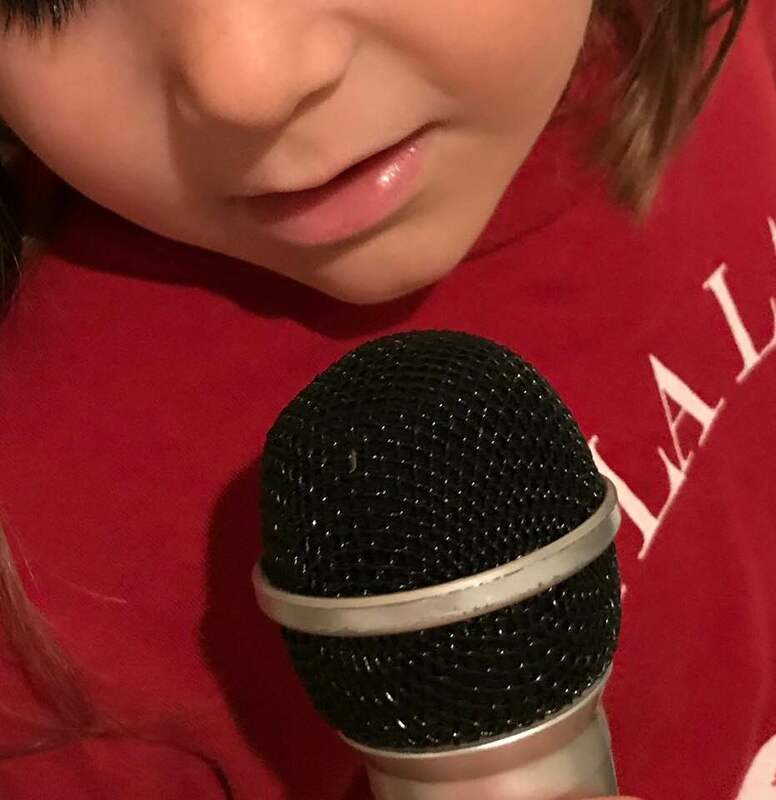 We will invite a few families to join us to perform on their instruments of choice, sing praise songs together, or maybe even bust out the karaoke machine for the bravest among us! 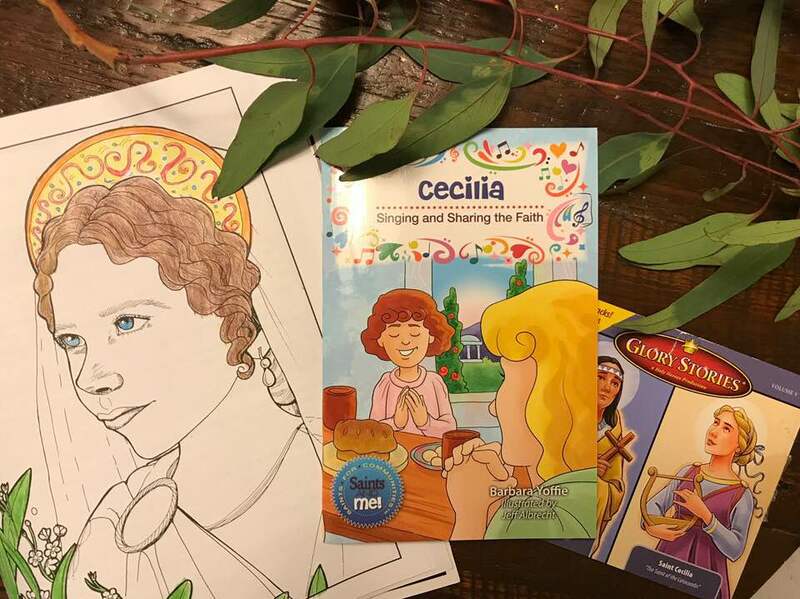 My plan is to begin by praying the Prayer of St. Cecilia, read a short book about her life, and offer friends refreshments as we listen to the performances. And what more perfect snack at a jam session than jam itself! I’ll spread out a simple biscuit bar with a variety of jams, jellies, and spreads for folks to choose from. Coffee, tea, and juice will be the beverage offerings, and if I’m feeling fancy, we might have some fruit, too. 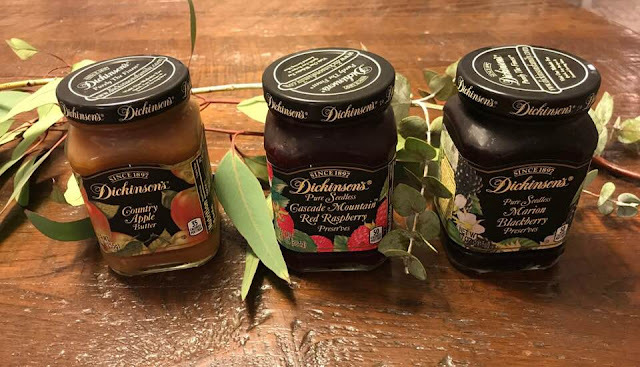 My friends are always more than willing to bring things to share, so I may ask them to bring their favorite jam, fruit, or biscuits, but honestly, this is a pretty simple spread, so I may even be able to pull it off without too much hassle! True confessions: my biscuits will be of the Pillsbury variety, and I can assure you none of my people will be disappointed. Insert Dough Boy giggle here. Simple celebrations are the best way to keep up with these feast days and to keep my own heart singing. My hope is that by creating these special memories with my children, they’ll really appreciate the Liturgical Year, and all the richness that it offers us. And that, my friends, really is my jam! Several past Catholic Cuisine posts have shared ideas for pasta meals based on the symbolism of the pasta shape. 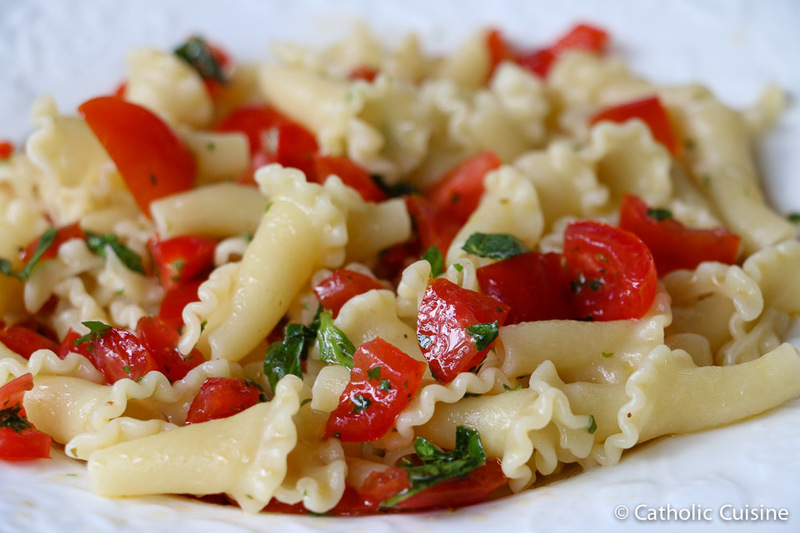 There are hundreds of kinds of Italian pastas, and each one has its own special name and each pasta name actually means something. Mafaldine or malfada, also known as reginette or reginelle (Italian for "little queens") is a type of ribbon-shaped pasta. Mafaldine were named in honor of Princess Mafalda of Savoy which is why they are also called "little queens." The pasta is flat and wide, usually about ½ inch in width, with wavy edges on both sides. The delicately fluted edges remind one of a crown. It is prepared similarly to other ribbon-based pasta such as linguine and fettuccine. On this feast of the Queenship of Mary (August 22) a pasta shape referencing a queen is perfect. 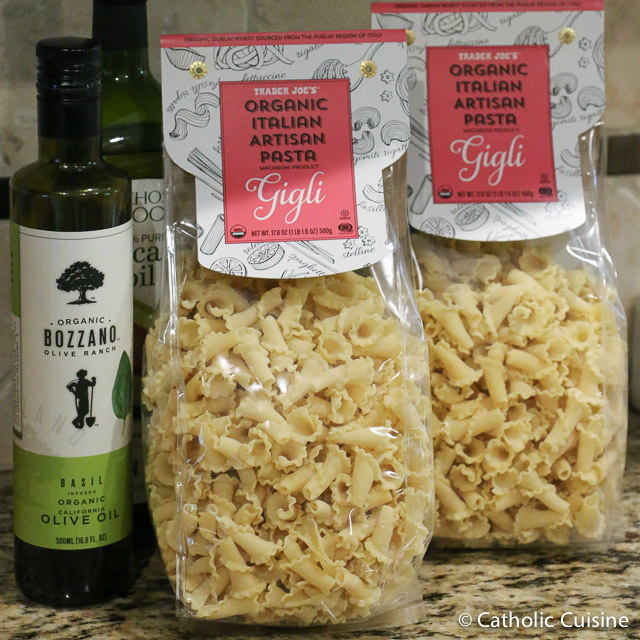 It would also be a great pasta to serve up on any of the queen saints' feast days, such as St. Margaret of Scotland, St. Elizabeth of Hungary or St. Helena. A variety of sauces could be served with this pasta. I chose a sun-dried tomato pesto which highlights the fresh bounty of basil from my August garden. Since August - the month of the Assumption and the one dedicated to the Immaculate Heart - is such a Marian month and is tied to herb harvest in her honor, it was fitting. 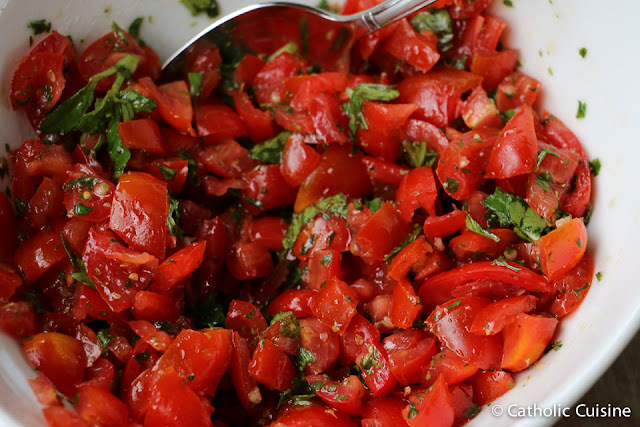 In a blender, place the tomatoes, pine nuts, cheese, basil leaves and oil and blend at maximum power. Cook the pasta until al dente in boiling salted water, drain and stir in the pesto. NOTE: Reginette/Reginelle pasta is not one of the most common shapes of pasta available in grocery stores. But I did find it available from Kroger as part of their HemisFares pasta brand. It is also available online and is specialty stores. Our Lady, Queen of Heaven, Pray for us! August 15, the feast of the Assumption, is a harvest feast day and associated with "first fruits". We are reminded that Mary goes before us in Faith and also as a first fruit of the Resurrection, of which all the faithful will experience at the end of time (1 Corinthians 15:20-21). In many Catholic counties Assumption Day marks the period for invoking blessings on various "fruits" or fruiting plants - - particularly vineyards/grapes, fruit trees, grains, and herbs. 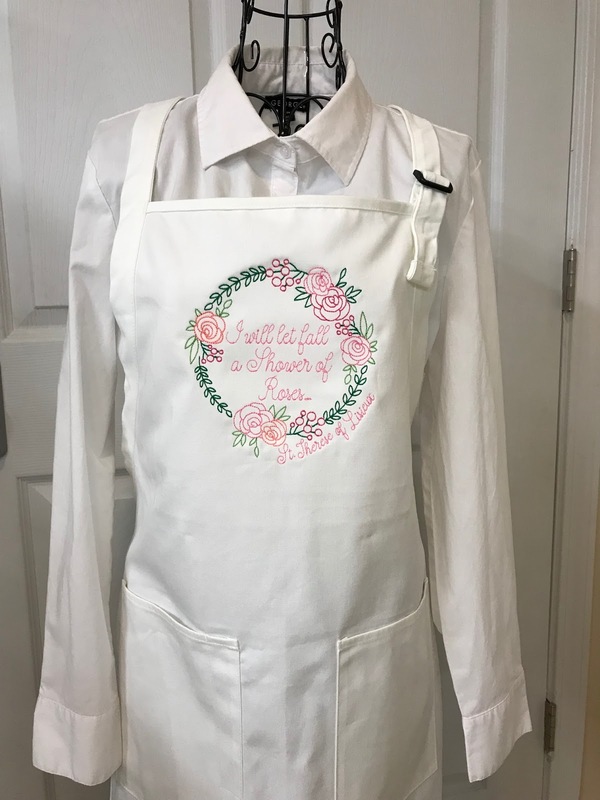 One idea is to serve "First Fruits" shortcake and topped with whipped cream - symbolizing the clouds of the sky in scenes depicting Mary being raised into heaven. 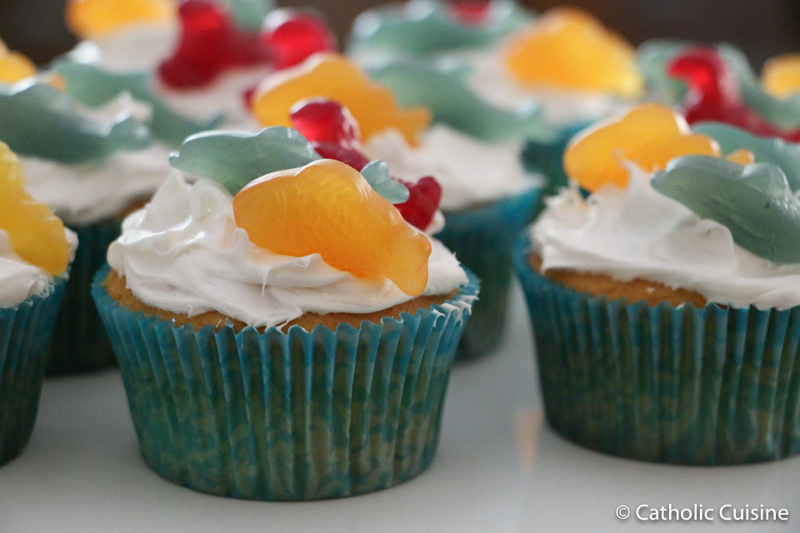 You can use a variety of fruits on packaged shortcake cups. A very simple idea along the same lines is a fresh fruit tray with whipped cream for dipping. Grapes are especially associated with the feast of the Assumption. Armenian communities all over the world bless grapes on Assumption Day. Great trays are piled high with ripe grapes and carried to church, where they receive the blessings of the priest. Since grapes so often have this prominence in Assumption feasting we will often have this refreshing grape enhanced salad on this feast day. To prepare dressing, whisk together vinegar, oil. mustard, and brown sugar. Stir in bacon pieces and onion. Refrigerate. In a large bowl combine spinach, cheeses, and grapes. Toss with dressing. O Clement, O Loving, O Sweet Virgin Mary, Pray for us. Bl. Solanus Casey, Capuchin friar and doorkeeper who was just beatified in November 2017 will be remembered on the first-ever celebration of his feast day this week, July 30. In the tradition of the Franciscans whose charism is care for the poor, Bl. Solanus had a desire to feed anyone who came to the door of St. Bonaventure monastery in Detroit. "They are hungry; get them some soup and sandwiches," Fr. Solanus was known to proclaim to his fellow friars. In 1929 at the start of the Great Depression Bl. Solanus had the idea to start a soup kitchen down the street from the monastery, where he could send anyone who came to the door looking for food. The Capuchin soup kitchen has a long history of feeding the hungry in that area of Detroit. A simple soup and sandwich combo would be a fine way to remember the hospitality of this simple man of God. 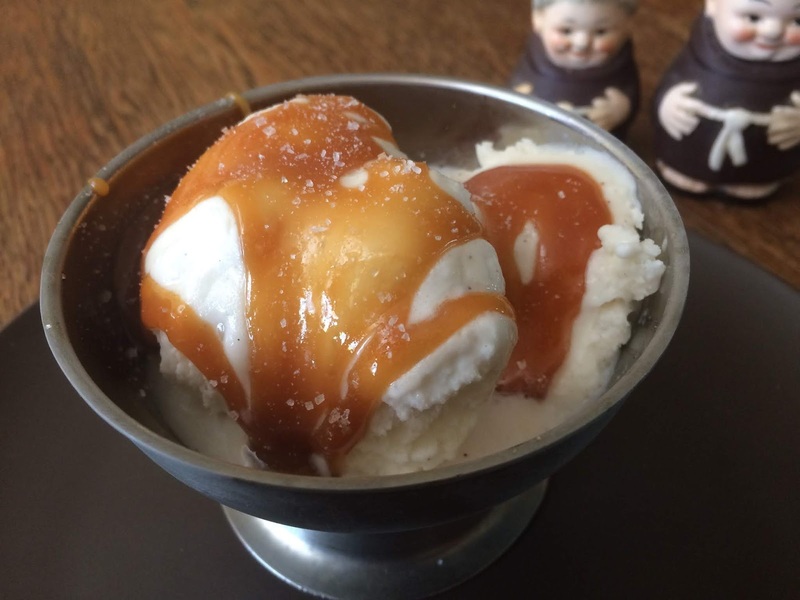 A very simple broth based soup and a peanut butter sandwich would reflect the simplicity of the Franciscan life. Or something cool and refreshing on these often warm summer days such as a cold gazpacho soup and a crispy lettuce, deli meat and cheese sandwich. Mid-summer days are also a great opportunity to take advantage of a fruitful garden harvest with a summer garden minestrone and fresh tomato-basil-cucumber sandwich. Have it with the family or open your home to friends in the spirit of Franciscan charity or take some sandwiches to distribute to the homeless in your city. Whatever combo you choose, or however you choose to enjoy it, make July 30 a combo soup and sandwich day to remember the generosity and hospitality of this simple wonder-worker priest. "They are hungry; get them some soup and sandwiches." This is a lighter sangria for July, but one with some significant symbolism for the month of the Most Precious Blood. One of the ingredients, blood orange, by name makes it very fitting for a drink to remember the blood of Christ poured out for us. The other unique ingredient to this recipe is the pomegranate arils (seeds). Pomegranates in Christian art symbolize the resurrection and eternal life in Christ. It is fitting as it is through the blood of Christ that we might have eternal life. As a summer drink, this recipe was a little hard to fulfill since both blood oranges and pomegranates are out of season. But it is possible to find packaged pomegranate arils in the refrigerated produce section of natural grocers. I also substituted the blood oranges for regular oranges and then used a bottled blood orange sparkling drink in place of the club soda. 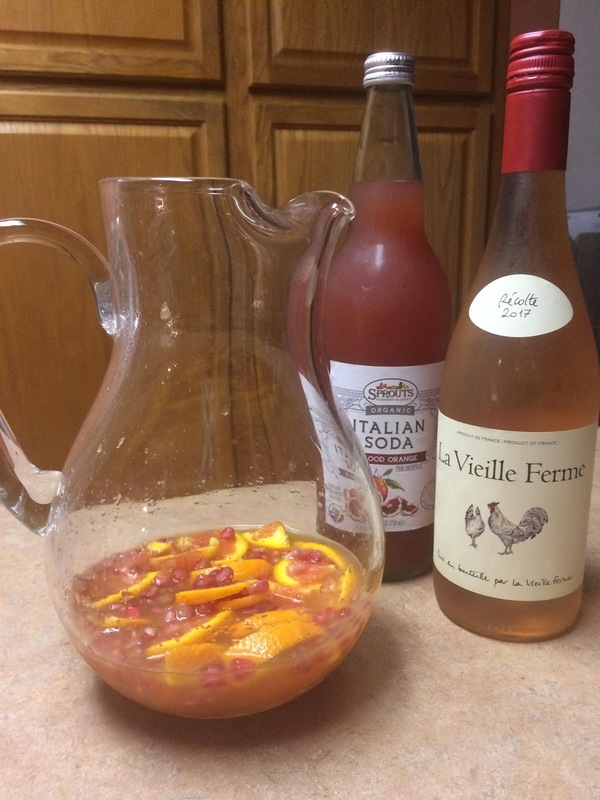 These substitutions made it possible to still make a delicious sangria which included the symbolic elements of blood orange and pomegranate. To make simple syrup, pour equal parts sugar and water into a saucepan and heat ingredients until dissolved. Cool. Juice two of the oranges. 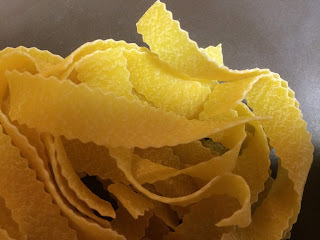 Slice the remaining orange into thin rounds, then cut into halves or quarters for garnish. In a pitcher, combine the simple sugar, blood orange juice, blood orange slices, pomegranate arils and brandy. Let the fruit marinate for a few hours, covered and chilled in the refrigerator. When ready to serve, pour in the rosé and sparkling water. 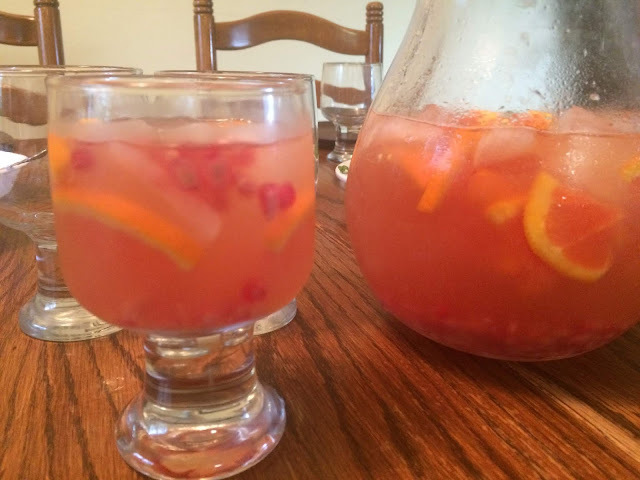 Ladle sangria and fruit into glasses and serve. Makes approximately 6 glasses. 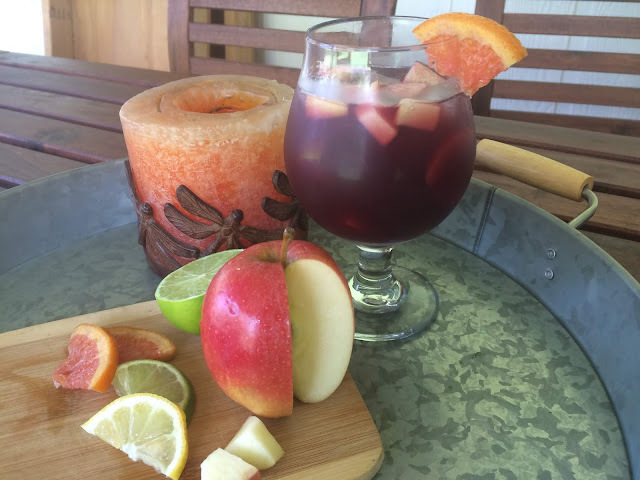 July is drawing to a close, but there is still time to enjoy a classic summer drink - sangria - perfect for the month dedicated to the Most Precious Blood. Sangre means blood in Spanish and the drink sangria took it's name from the red wine used, as it resembled the color of blood. Living in Colorado where there is a spectacular mountain range which extends into New Mexico named Sangre de Cristo (Blood of Christ), I always think of the word sangre/sangria as associated with Christ's blood. In addition to the dedicated month there are many saints with devotion and insights into the saving power of the Precious Blood and isn’t it convenient that several of them have summer feast days – perfect days to toast with a sangria and offer prayers through the saving power of the most precious blood. The Carmelite saint, St Mary Magdalen de Pazzi (feast: May 25) when in a rapture, saw that, “every time a human being offers up the Blood by which he was redeemed, he offers a gift of infinite worth, which can be equaled by no other.” Inspired by her vision, St Mary Magdalen de Pazzi offered the Precious Blood fifty times for the souls of the living and the dead, and then God rewarded her with visions of the multitudes of souls that had been saved from perdition or delivered from Purgatory. The Curé of Ars, St. John Vianney (feast: August 4), drew on the most perfect way of offering the Most Precious Blood: he asked Our Lady to offer it for him, and said that it never failed to obtain for him the grace or favor he sought. St. Dominic (feast: August 8), actually had a vision of Our Lady sprinkling devout people in his congregation with the Precious Blood. St. Maria De Mattias (feast: August 20), founder of the religious congregation of the Sisters Adorers of the Blood of Christ had a consuming desire that "not even one drop of the Divine Blood would be lost"; that it would reach all sinners to purify them and so that, washed in that river of mercy, they would rediscover the right way to peace and union among people. In a large pot or pitcher, combine the wine, brandy, orange juice, and sugar and stir until the sugar dissolves. Add the orange, lemon, lime slices, and the apples then refrigerate until well chilled, about 1 hour. Remove from the refrigerator and add the club soda. Serve in glasses over ice. 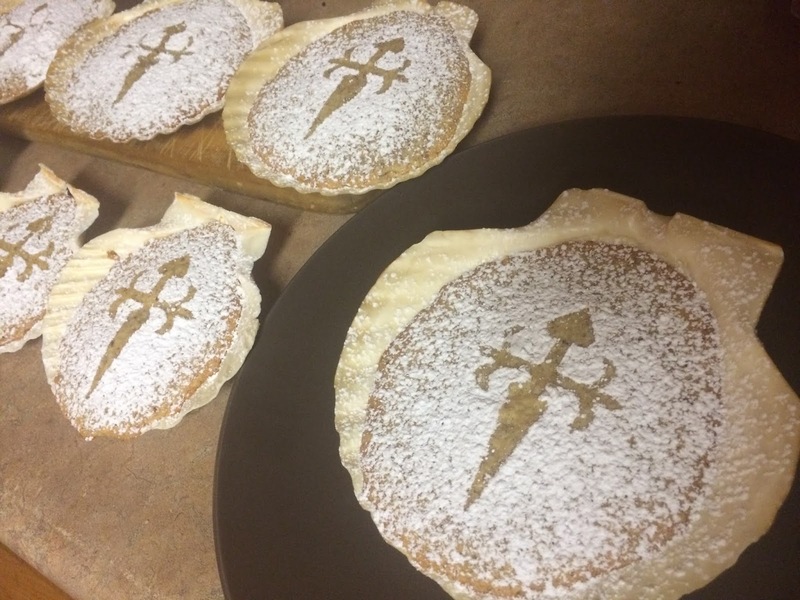 The Tarta de Santiago is a popular Spanish dessert, common along the Camino route. 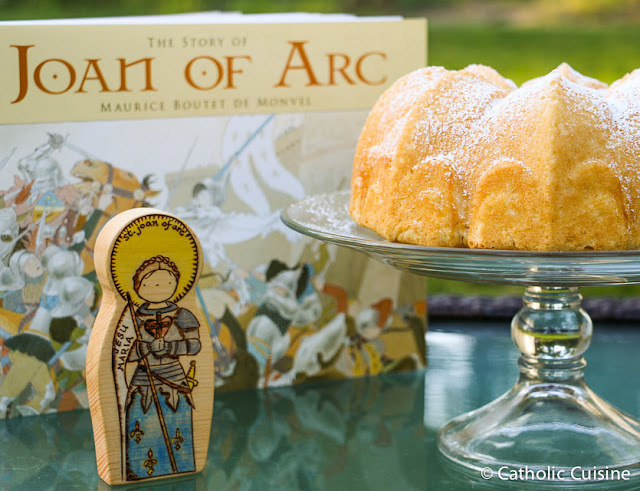 Named in honor of the apostle, St. James, the patron saint of Spain, this cake is made with ingredients typical in many Iberian desserts such as egg, lemon and almonds. The traditional Tarta de Santiago in a larger single cake and was highlighted in a previous post. 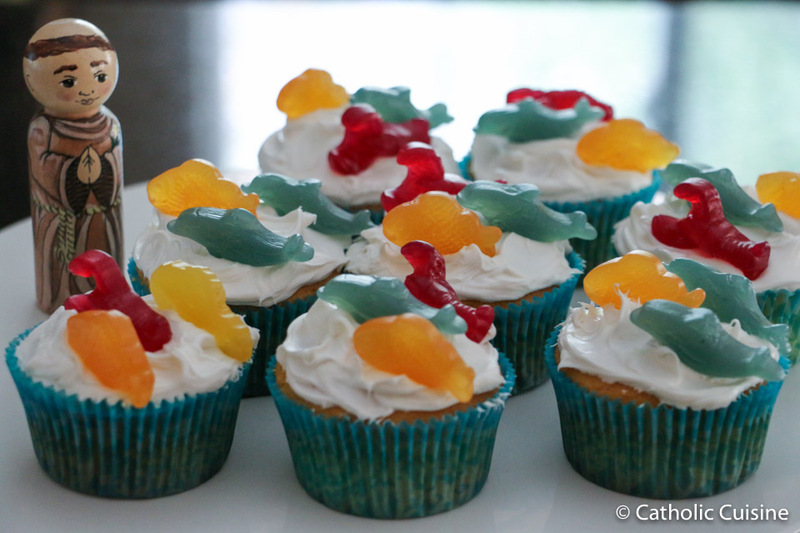 I came across this fun idea to make mini tartas using scallop shells as the baking pan. Since the scallop shell is a symbol of St. James this was perfect for the feast day, July 25. Preheat oven to 350 degrees. 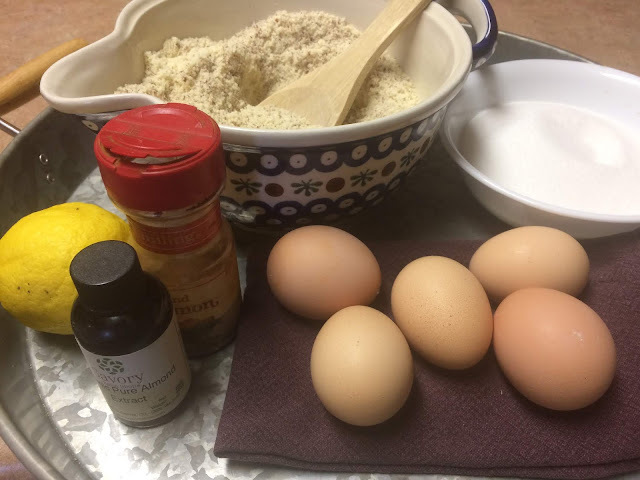 In mixing bowl beat eggs and then sugar and almond extract. Add almond flour, cinnamon, and lemon zest. Mix until all dry ingredients are moist. Spoon batter into buttered scallop shells. The shells are available at many craft stores and kitchen stores, as well as online outlets like Amazon. Batter makes approximately 8 mini cakes. 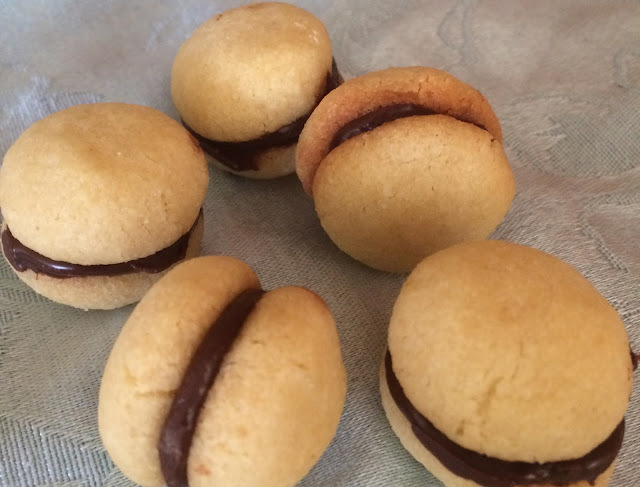 For stability and ease of getting them in and out of oven, place filled shells on baking sheet. Bake for 20-25 minutes until browned and cooked through. Test with toothpick. Let cakes cool. 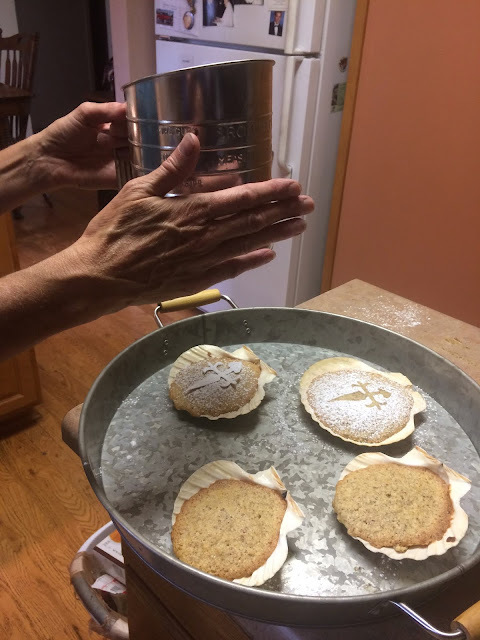 Sprinkle with powdered sugar using a sifter to distribute. A paper template of the Santiago cross can be placed on the shell before sprinkling then removed. This leaves a cross outline on the tarta. Cross template with instructions are linked here. St. James, Pray for us! Happy Feast of Sts. Louis and Zelie Martin! Here is a variation on the French Vanilla Cake and Cupcakes in Honor of the Watchmaker and Lace Maker found in the archives that I shared over at Shower of Roses last year. We used the rest of the cupcake batter to make a Cupcake Forest in honor of St. John Gualbert whose feast day is also celebrated today! 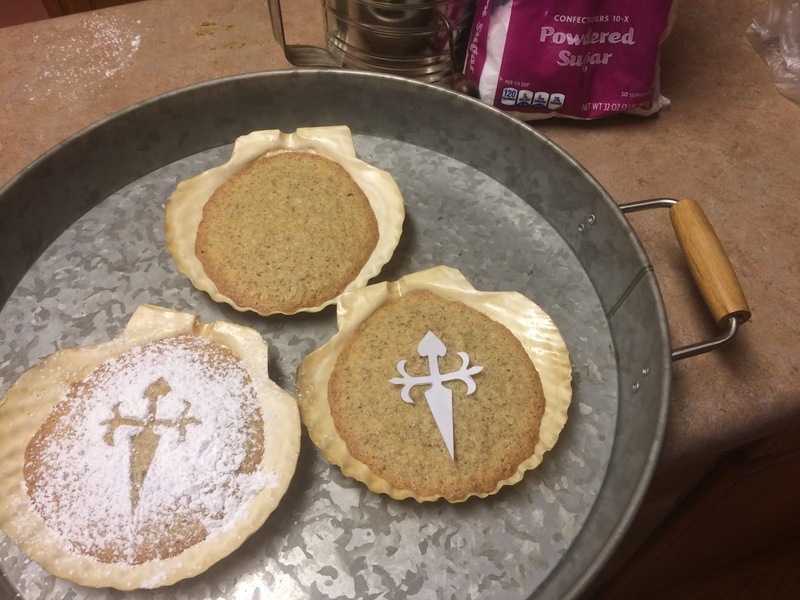 This clever feast day treat, with its play on words and creative symbolism to honor St. Thomas More, was shared by Rebecca Collazo. Rebecca is a homeschool mom to four wonderful kids who shares that she loves reading to her children, having poetry tea times, teaching writing at a Catholic co-op, and traveling to places of literary and Catholic significance. [And I would add thinking up creative liturgical year ideas to her talents.] 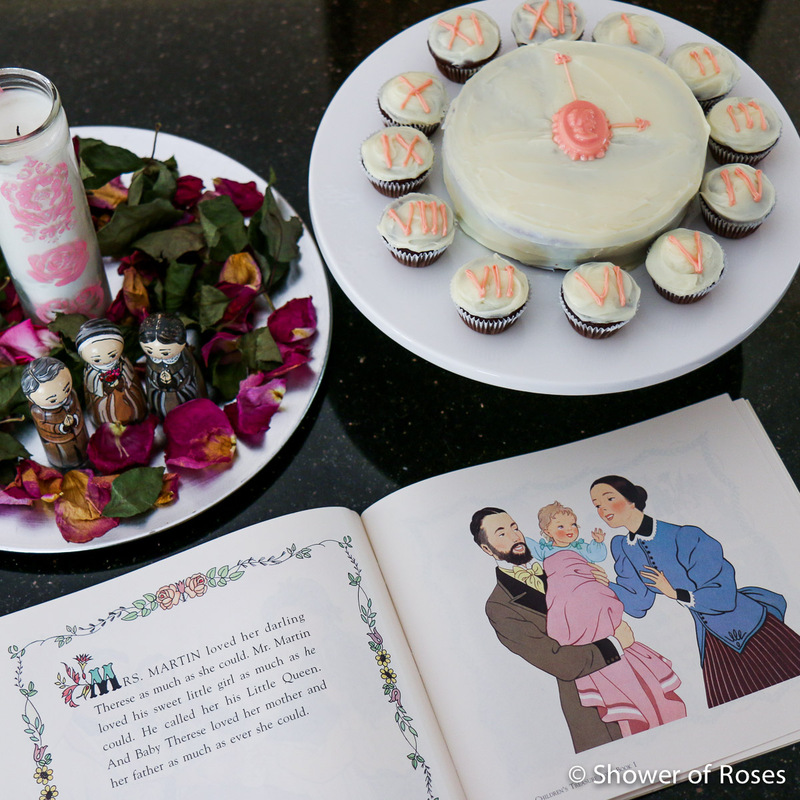 Thank you, Rebecca, for sharing such a cute idea that is special to your family. 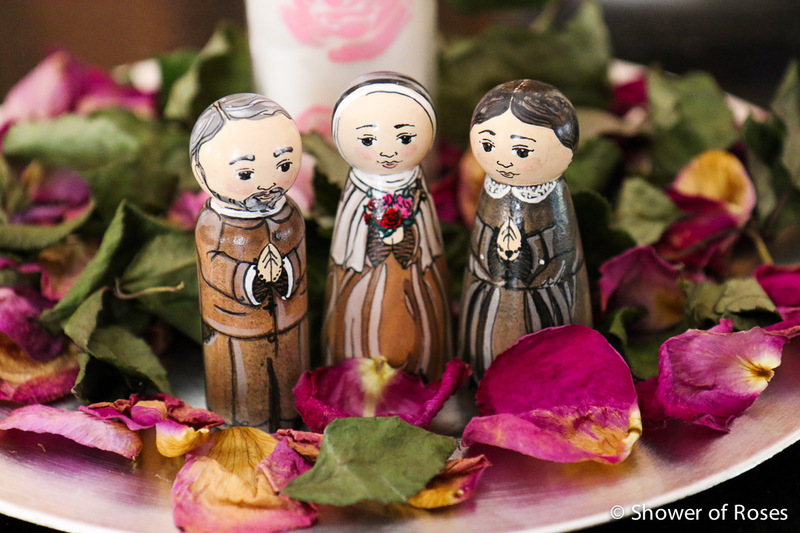 One of our family’s favorite feast days to celebrate is the feast of St. Thomas More. This fact is due partly because we go to the Co-Cathedral of St. Thomas More and partly because my husband is an attorney and has a special devotion to the patron saint of lawyers. This servant to King Henry VIII knew that service to the King of Heaven was more important than service to any earthly king and so allowed himself to be martyred for the faith rather than sign an oath stating he would honor England’s king as the head of the church. While we remember St. Thomas More for his brave sacrifice to stand up for the Church he believed in, it is said that he was also a man of great humor. It is for that reason that I feel like St. Thomas More would appreciate our family celebrating his feast day by enjoying St. Thomas S’Mores! 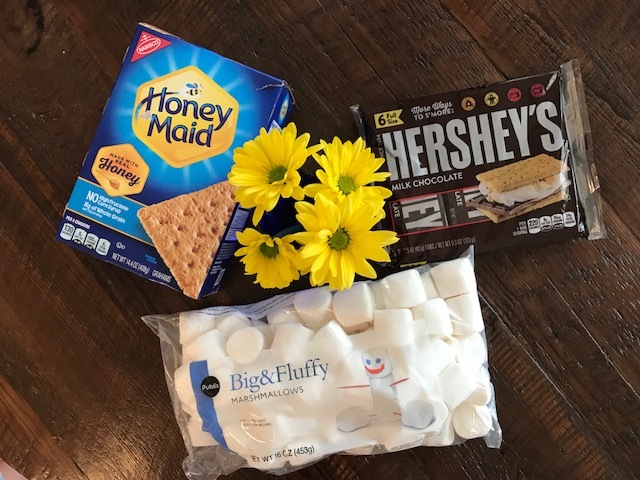 S’mores are such a classic summertime treat, perfect for his June 22 feast day. 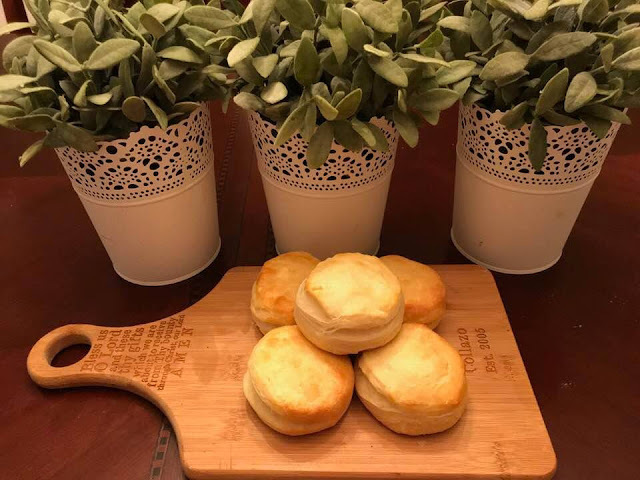 I have realized over the years, with my brood of four, that if I bring my kids to the table with a tasty treat, they are pretty likely to sit quietly and listen to me teach about any number of things. Sticky s’mores keep everyone contentedly occupied while I show them a video like this three-minute one summarizing the life of the saint: St. Thomas More video, read an excerpt from a book, or just regale them with the tale of More’s courage. 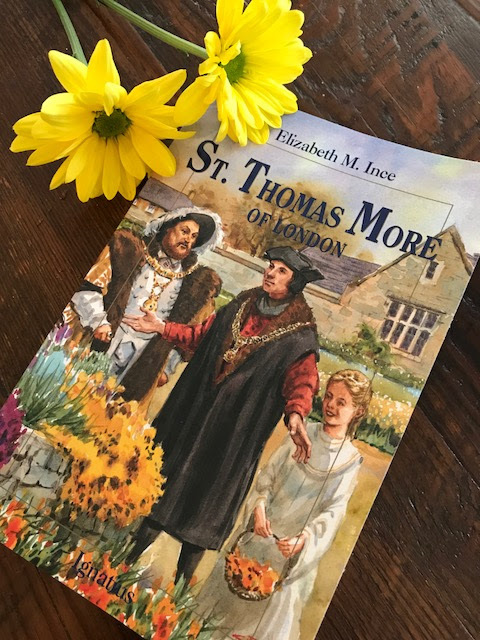 My eldest daughter is a huge fan of the Ignatius Press saint books and gobbled this one up: St. Thomas More of London. Another great way to introduce the family to the story of this inspiring saint is to watch the classic movie A Man for All Seasons starring Paul Schofield. You can find it on Amazon Prime. 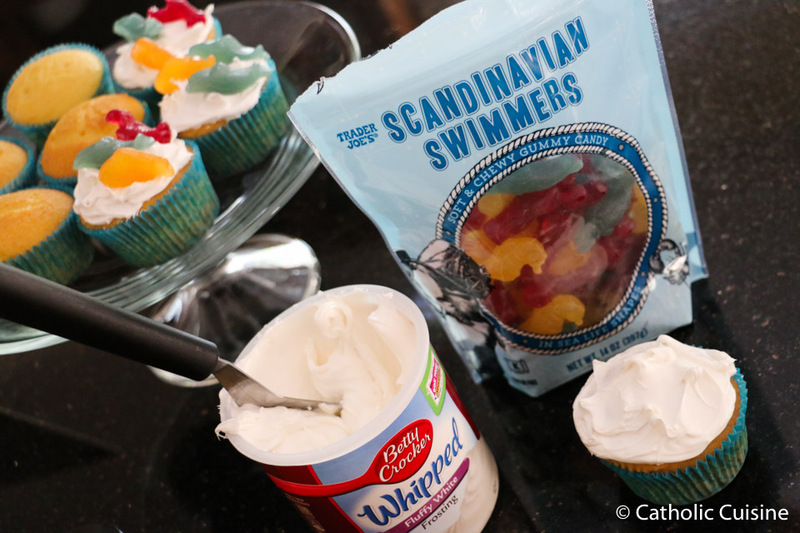 If you are not convinced that clever wordplay alone is enough to warrant this kind of decadence, then perhaps making it into a creative symbolic activity would allay your mommy guilt. 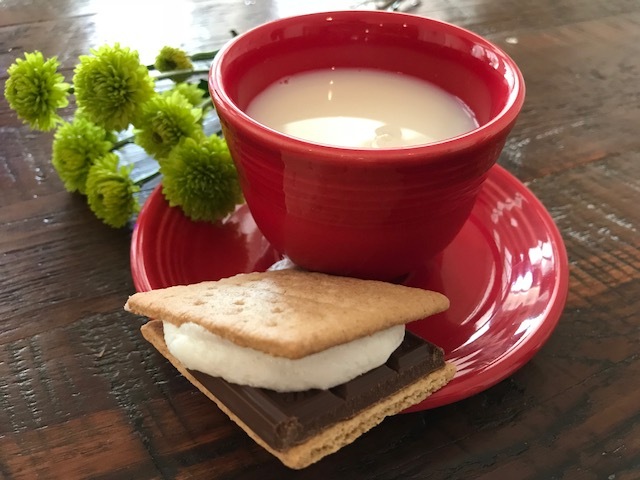 Tell your children that the chocolate is like the husband and the marshmallow is like the wife. The heat of the bonfire unites the two just like the sacrament of marriage unites husband and wife. Trying to separate them after they have been bonded through the sacrament is messy and nearly impossible to do. Remember that is what Henry VIII was trying to do by divorcing Catherine of Aragon. St. Thomas More’s disapproval of the king’s divorce and remarriage and breaking away from the Catholic Church ended in his martyrdom. “What God has joined together, let no man put asunder.” (Mk 10:9) Maybe that’s a stretch. Maybe you do not need an excuse to eat s’mores. 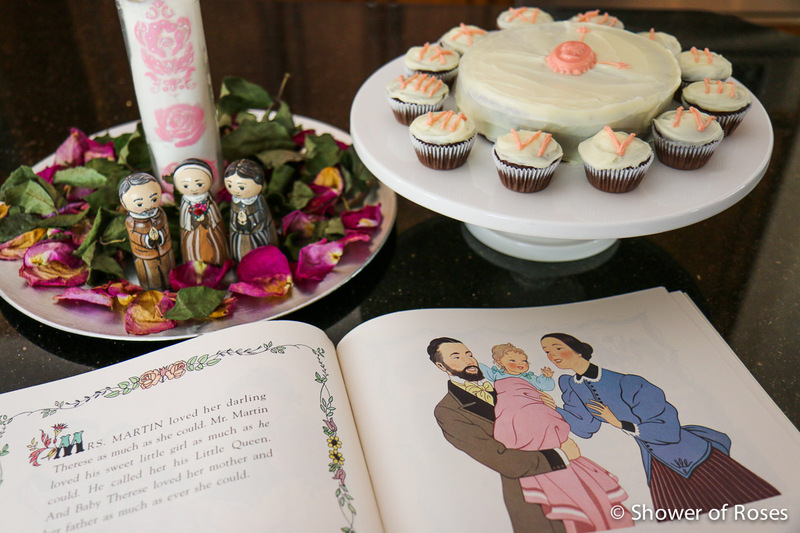 I feel like St. Thomas More would approve of a little celebration in his honor either way! However, if you need to balance it out a bit, how about having some classic English fish and chips? It honors not only St. Thomas More’s English roots, but it recognizes that he shares his feast day with St. John Fisher, another great English saint from the same era. You get bonus points for the pun on the name Fisher! St. John Fisher was also beheaded for not signing the Oath of Supremacy. So, for a complete dinner, dessert, and movie night on Friday night, go for some fish and chips, maybe a pint of cider (the hard variety for mom and dad and apple juice for the kids), and those tasty s’mores, followed by A Man for All Seasons while everyone digests. Happy feasting, friends! The Nordic Ware Fleur De Lis Bundt Pan is perfect for so many feast days, including today's feast of St. Joan of Arc since the fleur de lis is one of her symbols. These pictures are from a couple years ago, but the girls are planning to pull it out this afternoon to bake another cake for dessert this evening. 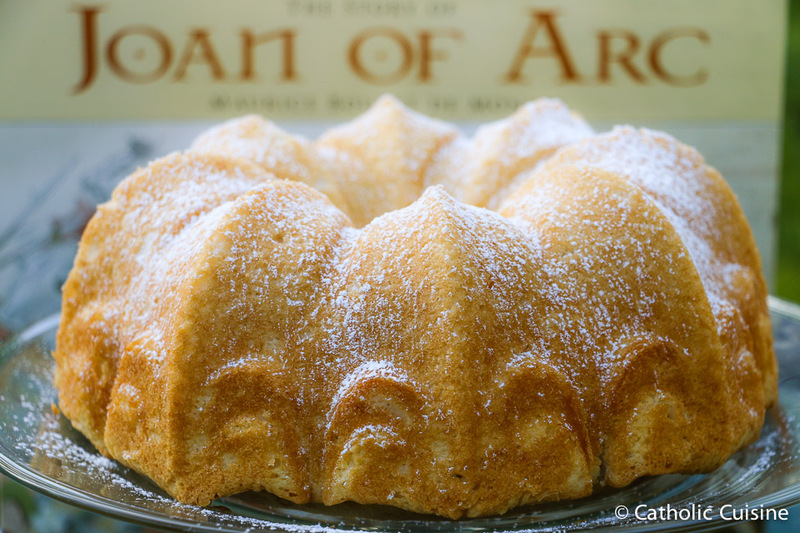 This cake is simply a French Vanilla Cake Mix baked in the Fleur de Lis Bundt Pan and then dusted with powdered sugar. If you have a favorite from scratch French Vanilla Cake recipe please share it in the comments below! April 29 (new) and April 30 (traditional) are the feasts of St. Catherine of Siena. Last night I ended up serving Pasta Santa Caterina for dinner. 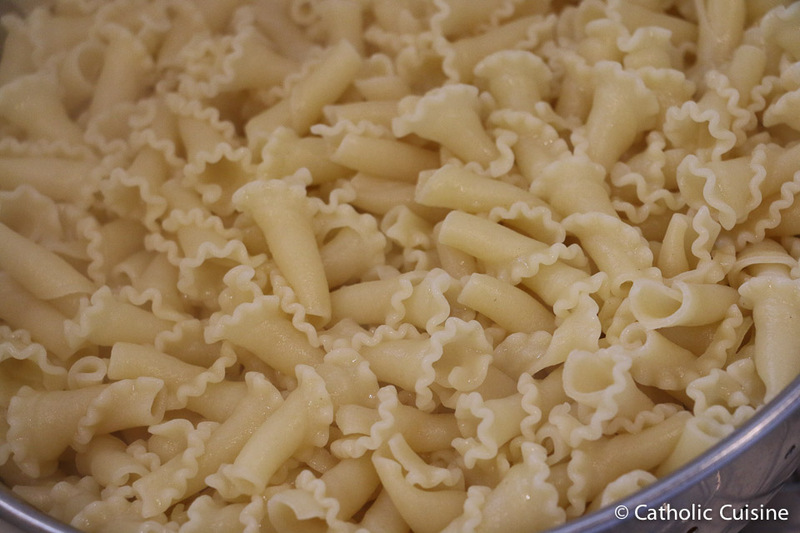 This time I made it with lily shaped pasta (Capanelle, also referred to as gigli or riccioli, translates to little bells or bellflowers) from Trader Joe's, since I had given some to our children in this year's family Easter Basket. The lily symbolizes purity. Its stoic structure, pure white color, and delicately sweet aroma attribute to qualities of royalty, purity, and chastity. It is the symbolic flower of the Blessed Virgin Mary and is sometimes depicted with other saints (including St. Catherine of Siena) who possess these qualities. A lily among thorns represents the Immaculate Conception as the purity of the Virgin is preserved among the fallen nature of the world. Legend says that the lily originated from Eve’s tears when she and Adam were banished from the Garden of Eden. Another legend claims that lilies sprang up from the ground when drops of blood fell to the foot of the Cross. During the Easter season, many churches line their altars with Easter Lilies to signify the resurrection of Jesus Christ and the hope of eternal life. This pasta would also be perfect for tomorrow's feast (May 1, St. Joseph the Worker) since the lily is also one of the symbols for St. Joseph. Peel tomatoes, remove seeds and dice. 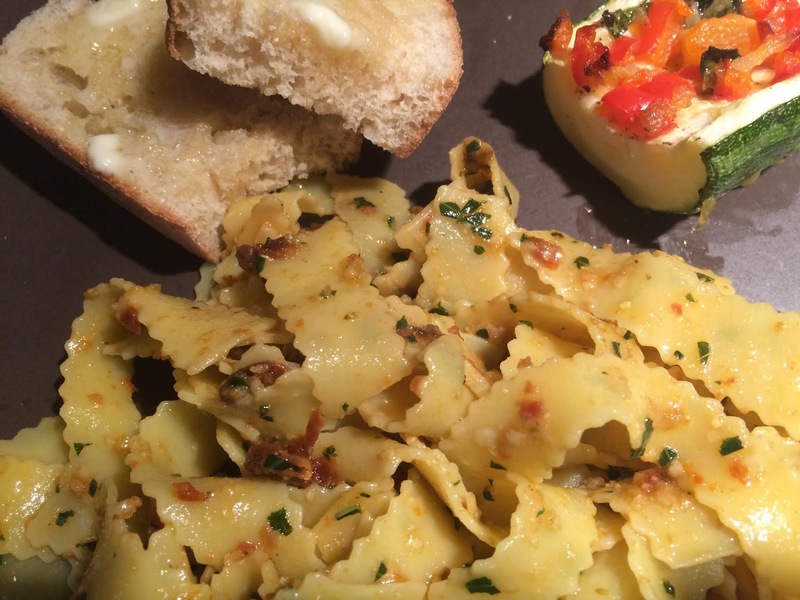 In a medium bowl combine all of the ingredients except the pasta. Marinate at room temperature for about 1 hour. Cook the pasta according to package directions, until tender. Drain thoroughly, and transfer pasta to a heated serving dish. Add the sauce and toss. St. Catherine of Siena, ora pro nobis! The peacock has long been a Christian symbol of immortality and Christ's resurrection. From ancient times the peacock represented immortality which came from a belief that the flesh of the peacock did not decay. For this reason the symbol became associated with the Resurrection of Christ with the early Christians and peacocks are found adorning the walls and tombs of the catacombs. In addition, the “multitude of eyes" on the beautiful fan tail, suggested the all-seeing eye of God and that of the Church. As we celebrate the Resurrection of Christ in the Easter Octave, the peacock can serve as a visible reminder of His rising from the dead. This fun fruit platter is made up of kiwi slices, grapes, and blueberries "feathers" surrounding a half pear for the body. Beak and legs were cut from a red bell pepper and the eyes are cut from the pear. Easter Symbols: Handcrafted Candy for Easter! Planning on having ham this year for Easter dinner? Ham has been a traditional part of many Easter meals, so if you are serving it this Easter consider adding a little Good Friday prep to your ham baking by doing the "cloving" on that day. Cloves are the unopened flower buds of the clove tree (Syzygium aromaticum), which is a tropical evergreen. They have an almost pungent aroma as well as a sweet and spicy flavor and are commonly used to flavor ham for baking. The word, clove, has an interesting etemology which I think links them well to this idea. They resemble small nails or tacks and their name comes an alteration of Middle English clowe, borrowed from the Old French clou de girofle (nail of clove) , from Latin clāvus (“nail”) for its shape. A clever idea could be to "clove" the ham on Good Friday in anticipation of cooking it on Sunday for Easter. On Good Friday as we contemplate Chist's passion and crucifixion, we can think specifically of those nails that held him to the cross. As you place the clove "nails" in the ham, you could reflect on those wounds He received. Using a sharp knife, score ham by making diagonal cuts in a diamond pattern, about 1/4 inch deep. Do not score the meat itself, just the fat and any skin. Place whole cloves in centers (and points, optional) of diamonds. Cover and keep refrigeratorated until ready to cook on Easter.